My Part-Time Beauty Blog: Star Sprinkles! I wanted to do a little write up about a magical polish I bought about a month and a half ago. I love to buy indie whenever possible and this little gem comes from Geek Chic Cosmetics and it's called Star Sprinkles. Inspired by Rainbow Brite (one of my favorite cartoons from my childhood). 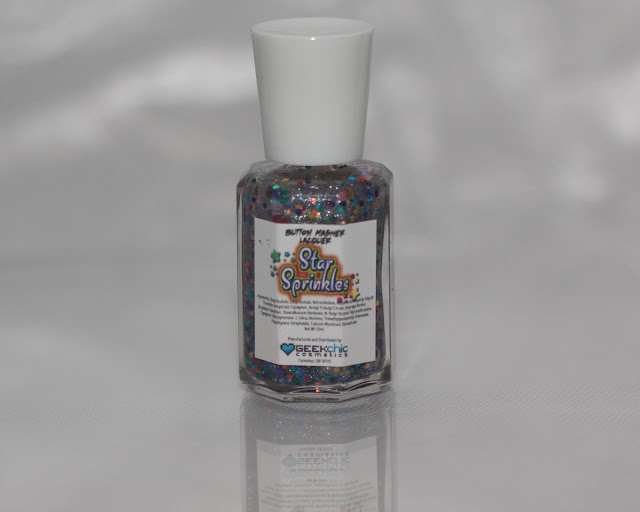 Star Sprinkles is full of multi colored glitter, blue stars, and silver shimmer. Since it's a top coat and not one to be worn alone, I used Essie's First Timer as undies with an accent nail of Essie In the Cab-ana with a light coat of Layla's Mermaid Spell on top. Top coat is Seche Vite and base coat is Orly Ridgefiller. Star Sprinkles back of the bottle. First Timer, In the Cab-ana, Star Sprinkles, and Mermaid Spell. All products featured were bought by me. All opinions are my own.